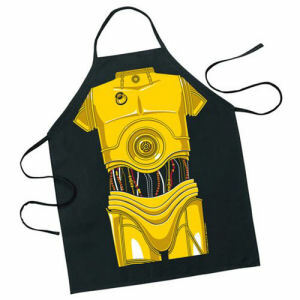 We have Just Sold out of Star Wars C-3P0 Be the Character Apron. This Item is unavailable at present. From the Star Wars collection by ICUP. Star Wars C-3P0 Be the Character Apron. One Size Fits Most! Size: 27in W x 31in H (68.5 cm x 79 cm), 24in (61 cm) neck loop, 33 in (84 cm) waist tie.